How do you catch a gannet? This has to be the most common question I get asked when I tell people what I do for a living. Prior to starting my PhD, my only experience of working with seabirds was a couple of days spent assisting researchers studying lesser black-backed gulls; my role was to help catch the chicks for ringing. This was a relatively simple task given that they seemed to be under the illusion that sitting really still, bodies in full view, but with heads tucked up under a peat hag meant that you couldn’t see them. So I knew that before I went out to catch gannets I needed some training with a larger, feistier bird. Luckily my PhD colleague Liz Morgan studies shags on the Farne Islands, so before setting foot on Bass Rock I spent a fantastic couple of days helping her catch and fit GPS tags to shags (you can read more about what her research involves here). At the time I remember thinking shags were pretty lively and slightly intimidating with that head shake and hiss (honk if its a male), however I don’t think Liz will mind me saying that the significantly larger gannet is the next notch up the intimidating scale. As I walked up through the Bass Rock colony for the first time, I have to confess to being quite intimidated by their size, that bright blue binocular stare and the length and pointiness of their beaks. It was time to switch on and stay focussed if I didn’t want to find out what damage 10cm of pointy bill could inflict. That said, the first rule when catching and handling a gannet is always protect your hands, arms and most importantly, eyes. So how do you actually catch one? 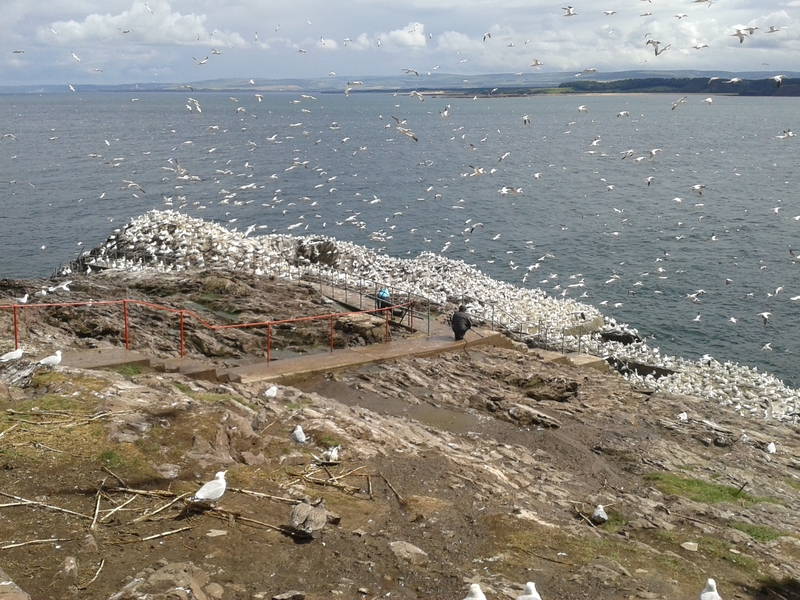 On Bass Rock there are so many gannets that as you make your way up the footpath from the lighthouse to the old ruined chapel, there are non-breeding birds that you could almost, if you were feeling brave and were very quick, simply grab by the neck. However, for our work we have to be selective about the birds we tag as we need to get the tags back in order to recover the data. For this reason we target breeding birds with young chicks. Gannet chicks are rarely left unattended, whilst one parent is off on a foraging trip the other will stay with the chick to protect it from non-breeders who are looking to take over unattended territories. By targeting breeding adults we can almost guarantee that they will return to their nest to take their turn at chick protection, allowing us to re-catch them and recover the GPS devices. Many suggestions have been put to me about how we go about catching them; luring them with bait, catching with a net and trapping by the leg have all been suggested, indeed you may have thought of some of those yourself, and they are all good suggestions but we actually use a noose or crook attached to a very long pole. Carefully manoeuvring the pole toward the chosen bird to try not to spook it or its neighbours, the noose is gently draped over the birds head and drawn gently closed. The noose is fitted with a stopper so that it can never be pulled too tight. The bird is then pulled out of the colony, quite unceremoniously, along the ground (so it can continue to take its own weight) towards waiting assistants. Now the understandably quite angry gannet can be carefully brought under control and fastened into a custom-made gannet jacket in order to restrain it safely and comfortably for the few minutes it takes to fit the GPS device. This sleepy gannet was one of the easier seabirds we managed to catch! Some gannets are certainly easier to catch than others. This non-breeder (right) was so unfazed by having the noose draped over its head that it tried to go back to sleep! 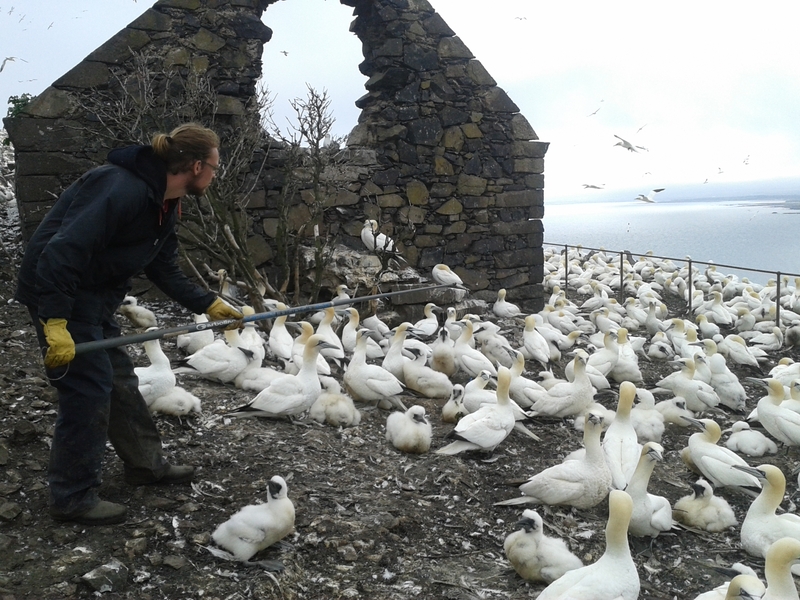 Catching immature gannets is certainly the most challenging task. Below you can see Jana Jeglinski from the University of Glasgow putting her gannet catching skills to the test as she attempts to catch a 3-year-old gannet from the large ‘club’ site (colony of non-breeders) around the helicopter pad on Bass Rock. As you can see, with no chick to protect, these birds have no qualms about taking off the minute it looks like someone is coming their way! Jana Jeglinski (centre in blue) in stealth gannet catching mode! ← How do we study seabirds? Early season success… on Who’s back? 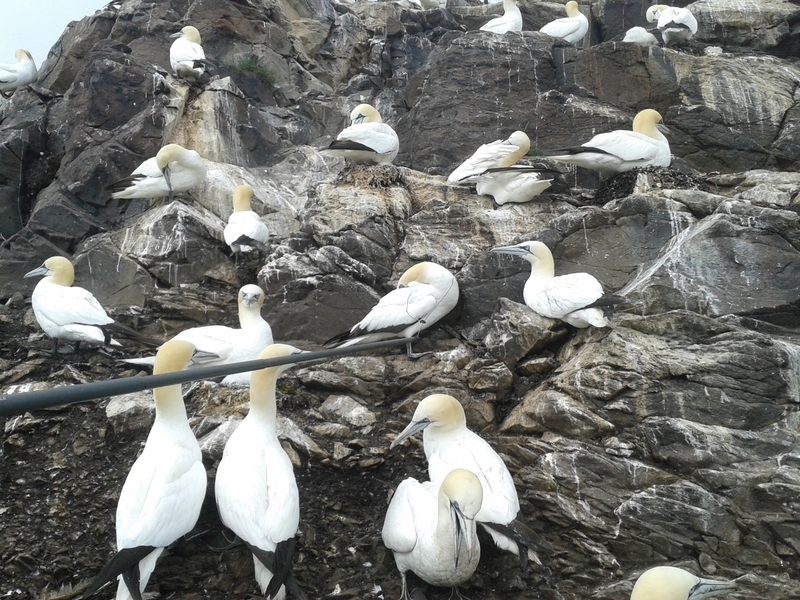 Early season success… on A Gannet tracking first? !